Gaios the capital of Paxos is a charming port town and spreads itself along the waterfront. You enter Gaios from a northerly direction passing two small islands, the first at the mouth of Gaios harbour is called Panagia (Virgin Mary) on which there is a splendid white monastery. On the 15th August, Assumption Day the gates of the monastery are open and everyone travels across by boat to the monastery to pay homage. The other St Nicholas Island forms a natural breakwater which leads to the picturesque inlet of Gaios harbour. On St Nicholas Island there are two small churches St Nicholas and St Ioannis and an old Venetian fort built in 1423 which for many years protected the area. Gaios square is a very good place to soak up the atmosphere of this bustling capital. There are a number of tavernas around the square and the lanes that lead off are lined with local shops, cafe bars, more tavernas and gift shops. In the centre of the square is the church of St Apostoli. Gaios harbour and the approaching inlet is very safe for overnight mooring for all types of boats. Water and fuel vehicles patrol on a daily basis. Online Travel guide with the best accommodation in Gaios. Find the cheapest hotels is Gaios & get exclusive online deals. Great rooms at bargain prices. Book online now! Compare Hotel Prices and read Reviews from others. Great Hotel rates and information See photos, reviews & what's nearby Gaios . 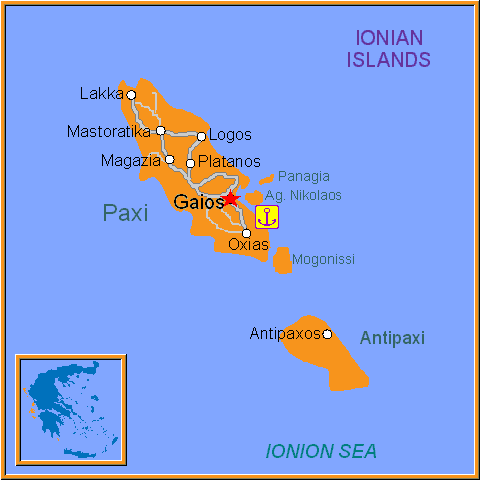 Detailed tourist and travel information about hotels of Gaios providing also regional information.